This entry was posted on February 22, 2013 by Tintean Editorial Team/fdg, in News, Theatre Notice. Bookmark the permalink. 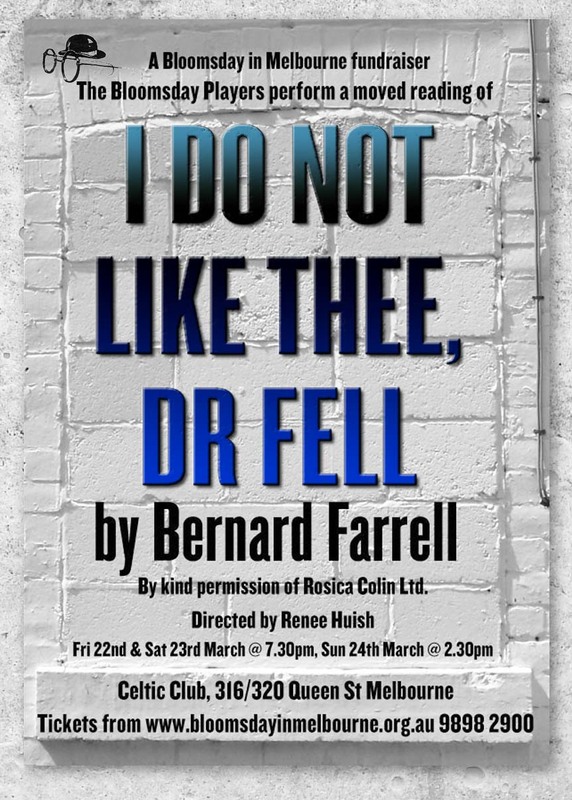 I Do Not Like Thee, Dr Fell by Bernard Farrell has been chosen by Bloomsday in Melbourne as its 20th Anniversary Autumn fundraiser. This continues the Bloomsday tradition of introducing patrons to a broad range of quality Irish theatre, including more contemporary plays. It follows last year’s success of John B Keane’s Big Maggie. 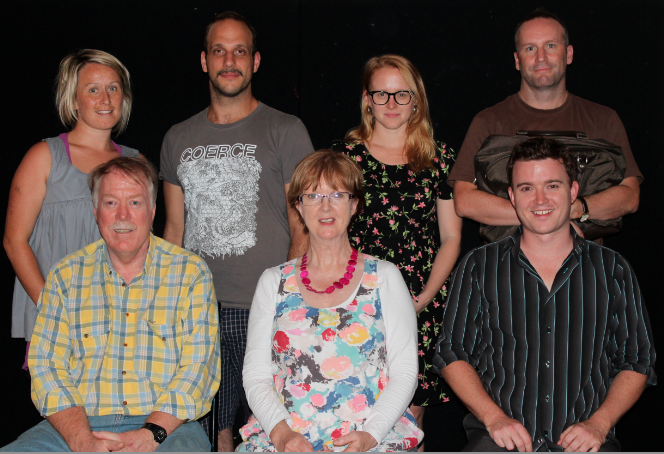 The play is a fast-paced dark comedy thriller involving six people who are in a locked Dublin attic room. All are participants in an overnight self-help encounter group and include the Group Coordinator, Miss Bernstein. It parodies the American psychotherapy groups that swept the West in the late 60s and early 70s. Odd one out in the group is Joe, who marries deviousness and innocence to expose the sexual and social secrets of the group, who challenges Miss Bernstein’s public face, and who manipulates the session right to its chaotic finish, in spite of the Coordinator’s valiant efforts to keep it on track. The well educated Roger, a young veteran of self-help encounter groups, gives the play its title through his quoting in Latin an epigram by Martial, and its famous interpretation and reworking by Thomas Browne. The unusual title of the play derives from the epigrams of Martial, a 1st Century Spaniard, and resident of Pompeii and Herculaneum. Some of the epigrams were somewhat risqué, and can be viewed in the appointment-only part of the Museum of Antiquities in Naples. One records, in beautiful sympathetic terms, the destruction of Pompeii and Herculaneum by the volcanic explosion in 79AD. They were popularised by Thomas Browne, a satirical English poet of the 17th century. To avoid expulsion from Oxford University, he was asked to do a test. The Dean set him the task of translating one of Martial’s epigrams from Latin. His interpretation so impressed the dean that the expulsion was waived. The Dean later became Archbishop of Oxford. His name was Dr Fell. An American, William Matthews published The Mortal City: 100 Epigrams of Martial in 1995. Tension is introduced to the encounter group with the arrival of suburban husband and wife team, Peter and Maureen, who, according to Peter, are there because of Maureen’s neuroses. The ageing, confused Rita makes up the group. A hypochondriac, she is grieving for her lost husband, and is hoping that she can contact him from the afterlife. Presiding over the incarceration of this sextet is Paddy, the Group Attendant, who locks them up and eventually liberates them. He is the voice of reason and normality in the whole affair, inasmuch as one can say that any of the participants are ‘normal’. When I Do Not Like Thee, Dr Fell premiered at the Peacock Theatre in Dublin in 1979 it enjoyed such overwhelming success that it was moved to the Abbey Theatre. Its success encouraged Farrell to resign his job to write full-time for the theatre. This first production starred a young Liam Neeson in the role of Roger. His second play Canaries was commissioned by The Abbey Theatre. In choosing this year’s play, wide-ranging research was undertaken of the contemporary Irish theatre. The majority of plays formerly mounted as fundraisers had distinctive Irish political and historic themes, addressing the woes and injustices of the past. I felt strongly that Ireland has in recent decades come of age and was becoming more part of the European community. Many contemporary plays, I felt, with a few exceptions, lack humour. A short list was drawn up and gradually Farrell started to emerge as a potential choice, with his first play, Dr Fell, ticking all the boxes. Above all it was fun. Some possible choices were discarded because of large casts, and a preponderance of male actors (which does not suit the profile of The Bloomsday Players). It was also clear that it was still appealing to 21st century audiences and still enjoys the reputation of being the most performed play by theatre groups around Ireland. In short, it promises be the perfect vehicle for reaching out to new, as well as traditional, Bloomsday audiences and the rights are available from Rosica Colin. Self-help encounter groups originated in California during the hippie era. The Second Vatican Council had taken place, television had come to Ireland, and censorship had lost its iron grip. A degree of affluence, hitherto unknown, was creeping into Ireland. A questioning generation was emerging and new ideas were embraced and adopted. Individual thinking, formerly discouraged by the Church, was happening, and Jung’s Memories, Dreams and Reflections was taking its place on the bookshelves of the thinking laity. This dynamic movement encouraged taking control of one’s own destiny. The background also pulses with the IRA/Ulster conflict where bombings took place on a regular basis. Farrell chose the right moment to embark on his writing career. Questions and issues raised in Dr Fell would have been unthinkable ten years earlier, and it certainly would not have then captured the public imagination as it did. For today’s theatre audiences, there are many parallels. The rapid growth of technology has increased access to knowledge and communication exponentially. The gurus of the hippie era have given way to a new breed of guru, especially in the health and fitness industry. In a cash-strapped world we are being encouraged more and more to take control of our own health by relentlessly monitoring the quantum self. Before casting the first stone at those who in the 70s pursued the meaning of life, just pause and check out Google and find out more about Quantified Self Tracking Communities, and teach yourself to avoid the pitfalls of contracting cyberchondria. Random bombings are now global, especially since 9/11. Social context aside, the key attraction in presenting I Do Not Like Thee, Dr Fell is how Farrell portrays the art of playwriting. Whilst the play was not presented to The Abbey until 1970 there is no doubt that the perfection of his art was many years in the making. It is sparse inasmuch as he pares the language back to its bare essentials, and any Director would be hard pressed to try to edit it in any way. The characters are introduced one by one, and they reveal themselves through their words, in crisp easy dialogue, but especially through their actions. He makes the use of pauses and interjections look easy. There are no dead spots in this play. He deftly develops his plot and no thought or idea is wasted. Whilst many could scoff at the plot, suspension of disbelief occurs naturally as the play unfolds. Our sympathy with the characters grows and is maintained throughout the performance. Born in Sandycove in Co Dublin in 1939 and now living in Greystones, Co Wicklow, Bernard Farrell’s credentials are deep and impressive: he has been awarded the Rooney Prize for Literature and was Writer–In-Association at the Abbey Theatre in 1996/7, and has served on the theatre’s Advisory Council and as Director of the Abbey Board. His work has been preformed extensively in Ireland and has been produced overseas in the USA, Canada, the UK, Belgium, Holland, Germany, Australia and New Zealand. Two of his radio plays represented Ireland at the Prix Italia in 1987 and 1992. In addition to his vast output of plays, he has also written for television for RTE and BBC, notably the long-running Glenroe for RTE. It’s an intriguing play – funny, quirky, thought-provoking. Hope to see you there. Renee Huish, Director of I Do Not Like Thee, Dr Fell for Bloomsday in Melbourne, performing at the Celtic Club, 22-24 March 2013. Tickets $25; $20 for healthcard holders and students. More information is available on the Bloomsday website.